COLIN O’Shea was part of the last Milltown team to win a Junior title back in 2008 and has enjoyed a rollercoaster ride with his club since then. He was a promising teenager back then, he played for the Kildare minors alongside the likes of Eoin Doyle, Mark Donnellan, Tommy Moolick and Paul Cribbin against Dublin in a Leinster Final at Croke Park the following year, but success hasn’t followed as readily as he thought it might. “2008 was my first year and we won the Junior title and you’re kind of thinking that this will happen every year. We went up to Intermediate but lost a few lads who went travelling. We were in intermediate for two years and came back down and since then I think we’ve lost four semi-finals and a final in 2016 as well. When you get to a final you have to take your chances. When you get there you’d already be looking at the teams in the relegation play offs in intermediate and thinking that if they come down it’s going to be tough. Two years ago when Ballymore came down you’d fancy them to go straight back up and they did. I think in some ways it’s nearly harder to get out of junior than to stay in intermediate,” he said. The final in 2016 against Kilcullen was as close as they got to a repeat of the 2008 success but they missed out after a replay and O’Shea feels that loss had an effect on their 2017 season. “Last year we had a bit of hangover from the year before I think. It’s tough when you are a small club and you make a big push and get so close, it’s disappointing when you lose. Kilcullen at the time were a lot stronger than us. Last year didn’t go too well but I think we brought in six or seven 17 year olds and they are all starting now which is good, they’ve given us new blood. I’ve gone from being one of the youngest players on the team to being nearly one of the oldest,” he said. Nurney man Declan Brennan was manager for that final in 2016 before Moorefield clubman Niall White came in last year, somebody O’Shea enjoyed working under, but Brennan is back in charge this season. “Last year was a tough year. It was Niall’s first year and it was probably tough coming from a club like Moorefield but I really enjoyed playing under him, he had a lot of good ideas. Declan came back in this year and he knows how the Junior Championship works and I suppose that helps. When you are setting up teams and going out to play Division 3 or 4 teams, he knows a lot of the players already. “We are going well enough this year. At the start of the year in the league, I don’t know how many games we drew, we just weren’t able to get over the line. We just knew if we could get correct that we could go well. I think we won all our games when the league split and we continued that into the Championship,” said O’Shea. 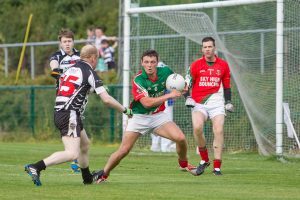 Milltown will start Sunday’s final as most neutrals favourites but after almost getting caught on the hop by Ballykelly in the semi-final, O’Shea says they won’t be taking anything for granted. “Rheban are a great team and we definitely won’t be underestimating them. We played them a lot over the last four or five years and I’d if you looked at it it’s probably close to 50/50 the way results have gone. We played Ballykelly in the semi-final and to be honest we didn’t know too much about them because we haven’t played them too often. We probably had a bit of an off day but a lot of that would be down to how well Ballykelly played. Semi-finals can be strange games, they are just there to be won and you don’t really care how you do it, you just want to get into the final,” he said.